Our friend Mark Rober from NASA makes some awesome videos, but this science experiment must be his best yet. He basically demonstrates that 6 per cent of all drivers are sadistic animal killers. • He alternatively placed a rubber animal — and a leaf as a control object — on the shoulder of a road: a turtle, a snake or a spider. • He watched 1000 cars pass by and annotated the drivers' reaction. The results are quite surprising. He found out that 94 per cent of drivers did what anyone in their sane mind would do: keep driving in their lane. Remember that the animals were on the road shoulder, way outside their driving path. They didn't pose any danger whatsoever to their safety. On the other hand, 6 per cent went out of the driving lane to run over the animals. Think about that: 60 out of 1000 drivers actually went out of their way to kill a living thing that didn't represent any danger to their lives — and risking their own life in the process, no less. Six per cent were just cruel because they could for their own sadistic pleasure, I can only imagine. Mark says that "one thing that might explain the higher numbers here — in case people question my methods — is that I used a tarantula." Apparently, people seemed pretty eager about hitting a spider. "If you take that out it goes to 2.8 per cent, which is closer to the other turtle vs. snake studies I ended up finding." It is still quite a surprisingly high number. At least compared to a 2008 study using the Psychopathy Checklist, which discovered that 1.2 per cent of the US population were potential psychopaths. 1.2 vs 2.8 is a huge difference. 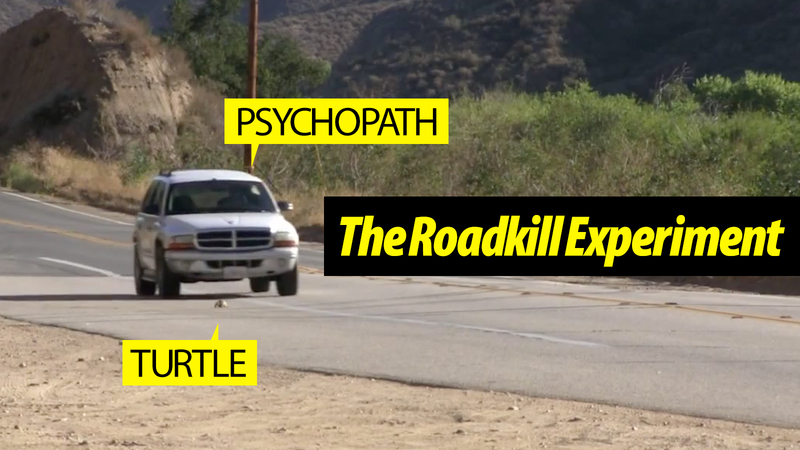 Needless to say, if a turtle or a snake is in the middle of your lane, never risk your life to save it. Your safety must come first, but this was not the case. This was all the contrary.